The hill station offers amazing holidaying option for one and all. All kinds of tourists with varied interests and age group will find something of their liking at this popular hill station in the state of Tamil Nadu. Often referred as the "Queen of Hill Stations", Ooty has mesmerizing scenic beauty, exotic flora, rare fauna, refreshing environment and tons of adventurous sports for excitement. The hill station of Ooty which is just at a distance of 564 km from Chennai present a perfect break from the hustle bustle of city life and allow visitors to spend some quality moments with nature. Chennai and Ooty are are well connected to each other via all the three modes of transportation such as roads, railways and airways. The nearest airport is Coimbatore airport while Mettupalayam is the nearest railway head from Chennai. If travelling via road, one can hire taxis or take a bus (A/C and non A/C). However, only this is not enough, for an wonderful trip, one also need detailed information on Ooty and access to the facilities when needed. There are many kinds of Ooty Packages from Chennai but in spite of these, tourists needs to be sure of the service quality and facilities provided. We at Ooty Planet, offer wide range of tour packages catering to varying requirements of tourists and different budget limits. Some of the Ooty Packages from Chennai that we offer are Honeymoon packages, family tour packages, adventure packages, business tour packages, etc. No matter which Chennai Ooty package you choose, you will be offered timely and efficient services. We offer our clients with best deal possible without compromising on quality of the services. For those of you, who want to have their vacation exactly in the way they want., we offer customised Ooty packages from Chennai. Our highly qualified experts also guide you throughout the trip and help in all the way possible. FOr example, we offer detailed and updated information on the hill station like on on ooty resorts and hotels as well as suggestions on the best time to visit Ooty, details on sightseeing commuting within the hill station and many more. Ooty has been rightly called as the "Queen of Hill Stations". The hill station in the state of Tamil Nadu presents outstanding natural beauty and a charm that is unparalleled to any other. It is a holidaying destination worth visiting at least once in lifetime. From captivating natural set up to soothing environment to adventurous outdoor and indoor sports to relaxed and calm atmosphere, Ooty has almost everything to make your tour a special one. Imagine spending some time away from the city life of Chennai and into the lap of Mother Nature. Isn't it creates a picture of perfect holidaying? In spite of all this, one's Ooty trip can go all wrong if you don't have right amount of relevant information about the place and access to required facilities at the right time. Although there are many Chennai to Ooty Packages in the market for you to choose from, going with a reliable and efficient service provider is what will ensure a hassle free vacation. Ooty Planet, an important division of Holidays DNA promise enjoyable vacation to each and every one with its timely and high quality of services. There wide range of Ooty packages from Chennai offered by us that caters to all kinds of tourists and their varied needs and requirements. Chennai and Ooty are at a distance of approximately 564 km and are well connected via roads, railways and airways. The nearest airport is the Coimbatore airport and the nearest railway head is Mettupalayam. One can also hire taxi and travel to Ooty by road. There are many bus services also available from Ooty to Chennai. At Ooty Planet, tourists get wide range of choices to select from. Ooty Packages from Chennai offered by us are created after taking into consideration various aspects like requirements based on kinds of vacation, budget and people travelling. Some of the kinds of Ooty Chennai tour packages are Honeymoon packages, family tour packages, adventure packages, business tour packages and many more. Along with this, for those who are particular about their requirements and budget, we also offer customised Ooty packages from Chennai catering to their preferences. 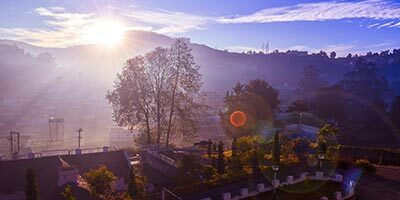 Along with offering tour packages, we at Ooty Planet also assist our clients in every way possible and updated and detailed information on all the aspect about the place such as on ooty resorts and hotels as well as suggestions on the best time to visit Ooty, details on sightseeing commuting within the hill station, etc.